Instagram stories vs. Snapchat as a whole is like comparing Holyfield to Tyson when they met up in the ring. Both are powerhouses in their own right but I am about to give you my very personal opinion on each. Let's start with Snapchat shall we, I held off on the Snapchat train up until a year ago. So many people kept telling me to get the app that it was just so fun. I gave into the peer pressure because I needed to see what all the kids were using, and try and figure out how to make it work as a platform for a business. Snapchat is great, I snap my friends at least 10 times a day, the filters are equal parts fun and hilarious, my personal favorite is the one that smooths everything out, I like to call it the Barbie filter. The down fall of Snapchat for a business is that people need to first find you by your user name and then add you, which you then need to approve them. So many steps. If Instagram stories did't exist I would 100% say you should be on Snapchat to give a "behind the scenes" of your day to day business. However, Instagram stories do exist. Instagram is so much easier to gain followers as long as your business profile is set to public. There aren't the extra steps of searching, requesting and approving. People can just search you, follow you and see both your well curated feed and your "behind the scenes" of your life stories. The one thing Instagram stories is missing are the fun filters, but I wouldn't be completely surprised if those are on their way soon. 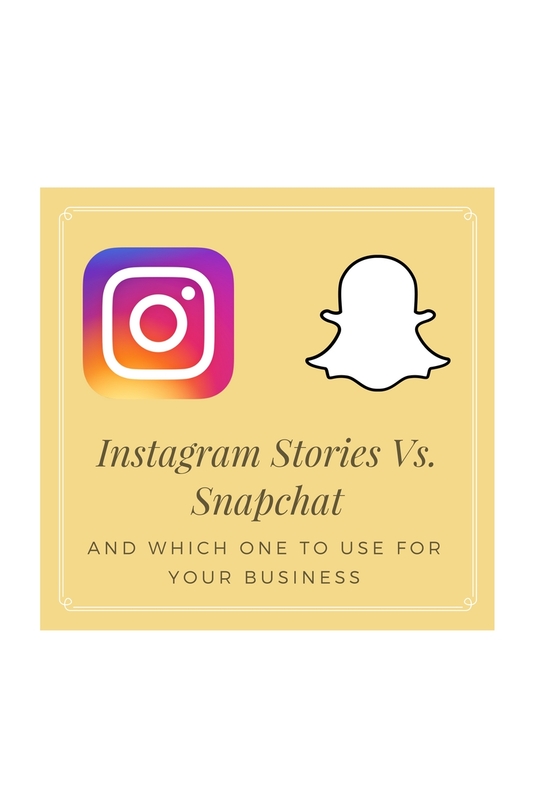 In the end from a business standpoint I think doing Instagram stories is your best bet. Your following wants to feel like they know you, they want to see the inner workings of your business, they want to see you as a real person, not a thought out and curated feed. Let's save the Snapchat for being silly with your friends, because you do need to approve who can see your feed and you can individually send snaps to whomever you choose in your address book. If you are a business and need ideas of what you should be showing in your Instagram stories, shoot me an email and let's chat.